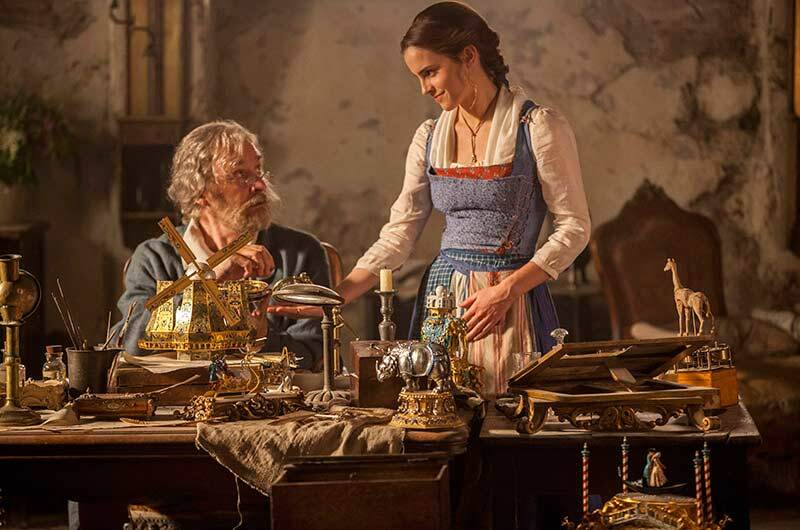 Belle [Emma Watson] assists her beloved father Maurice [Kevin Kline] as he makes his intricate music boxes which depict different places around the world. 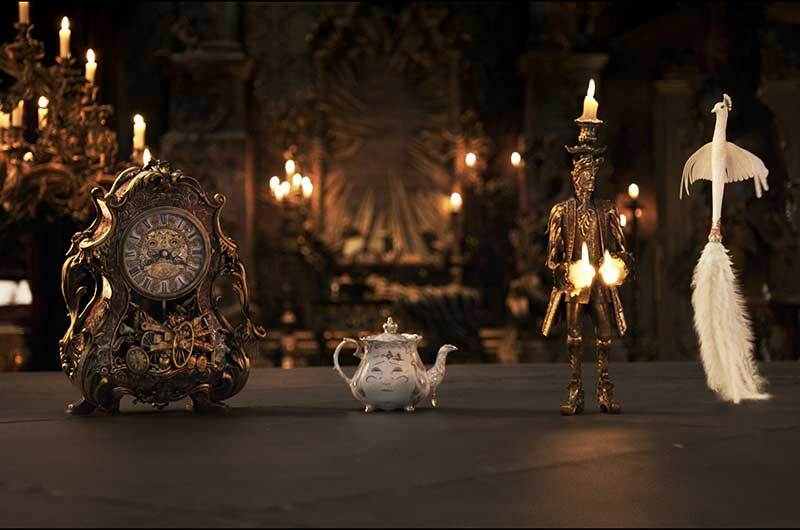 Because they exist in an enchanted and magical environment, these are not just music boxes, but portals to other worlds! 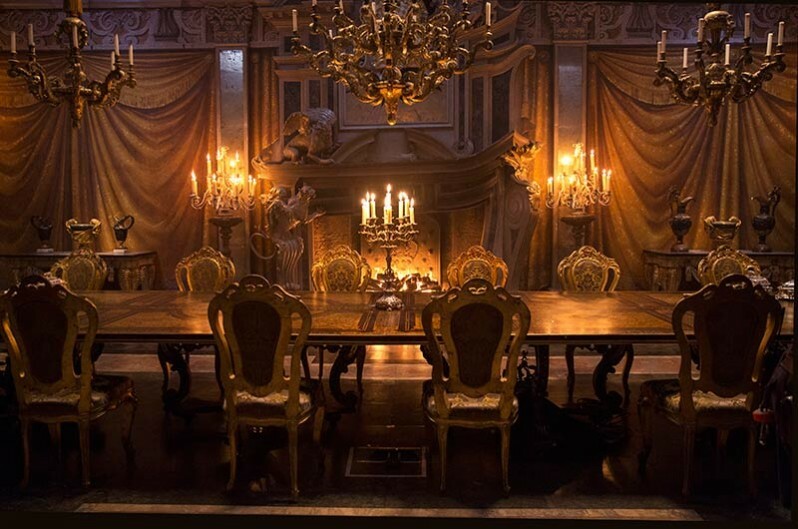 Spencer had to have the tables specially made to take the weight of 20 men jumping on them – not a normal set dressing order! 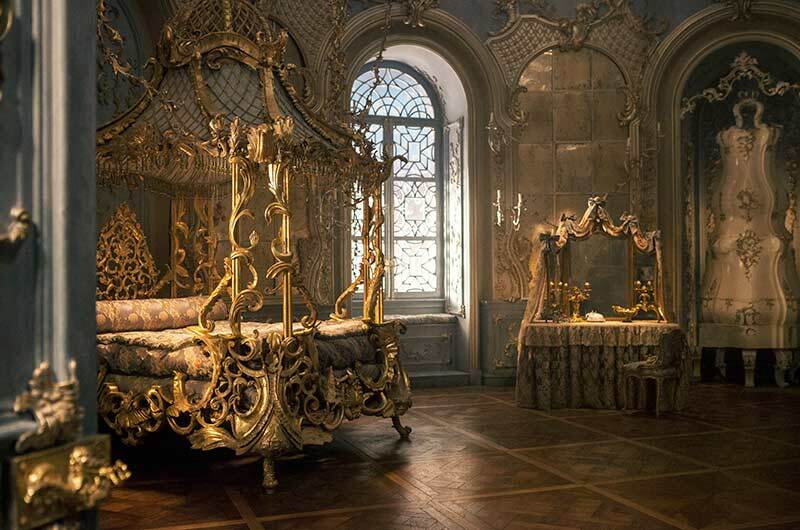 The Rocco-style bedroom, reminiscent of Versailles, is definitely fairy-tale-esque! Each of these and several other characters were actually made in various sizes, then photographed for animation...definitely a collaborative effort! 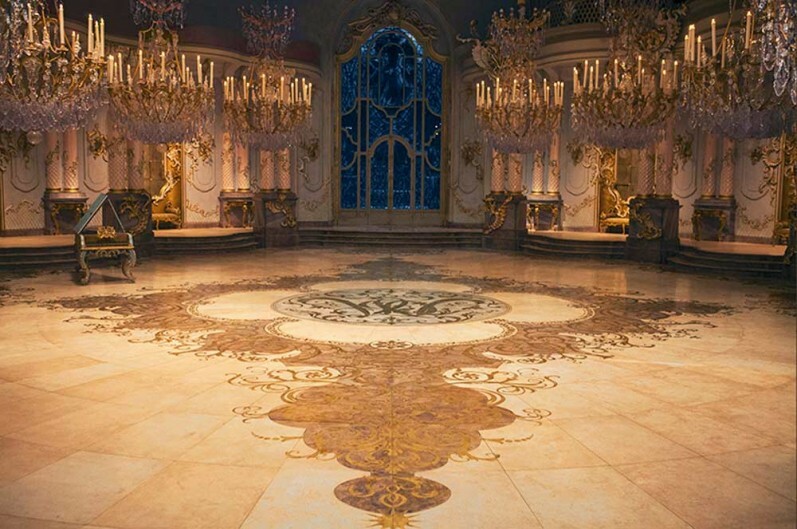 14 ft by 7ft Versailles-like chandeliers! 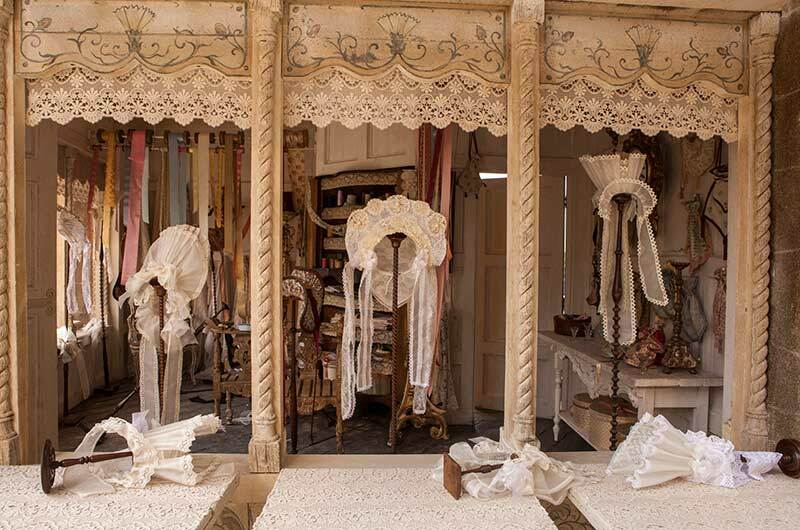 In the story, Madame de Garderobe takes gold gilding from the ceiling of Belle’s bedroom and sprinkles it onto her gown. Costume Designer Jacqueline Durran, whom Greenwood & Spencer have worked with often, had the dress accentuated with 2,160 Swarovski crystals. 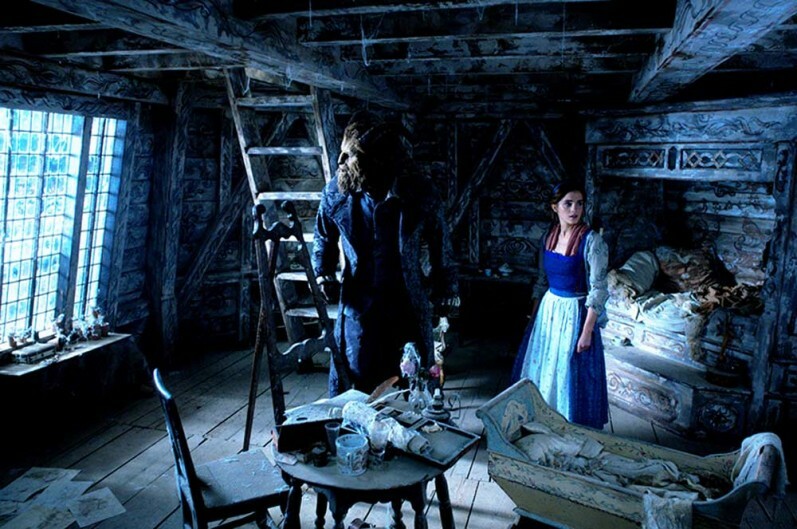 BEAUTY AND THE BEAST, directed by Bill Condon. 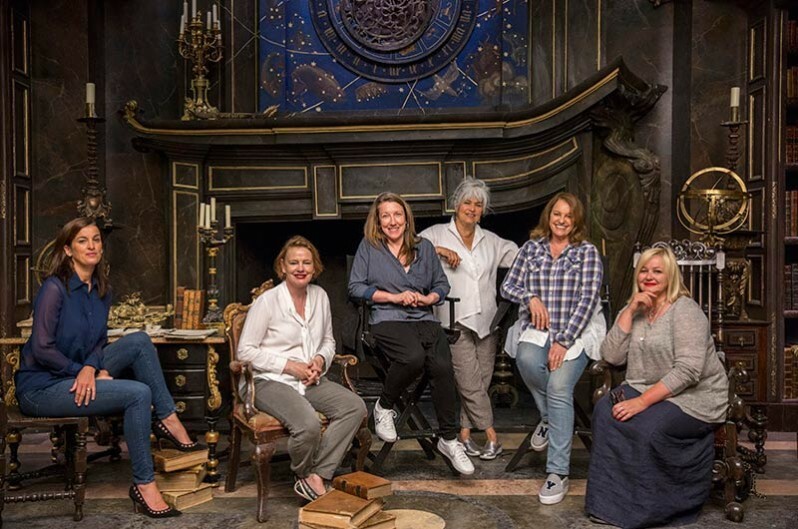 Photo by Laurie Sparham ©2017 Disney Enterprises, Inc. All Rights Reserved. 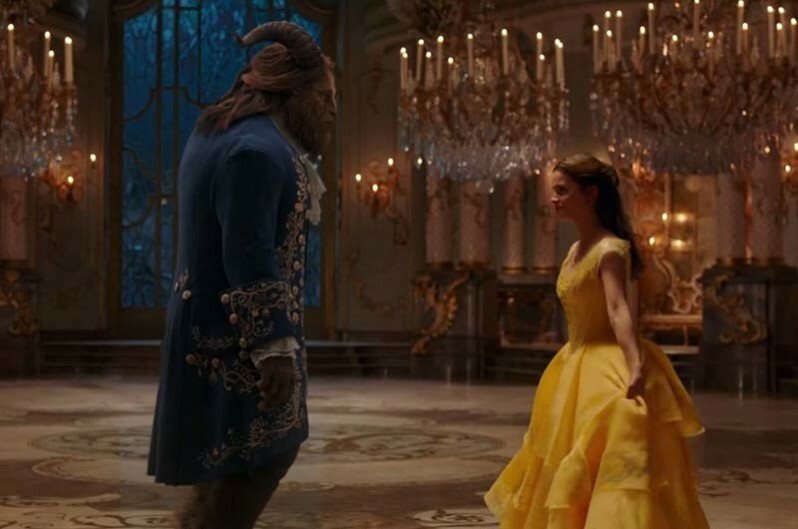 To bring to life today the tale as old as time, BEAUTY AND THE BEAST, while honoring previous incarnations including the exquisite animated version of 1991, Director Bill Condon brought in the magical team of Production Designer Sara Greenwood and Set Decorator Katie Spencer SDSA, along with other of the world’s top film-making department heads, which fittingly for this tale of female empowerment, many of whom are women. 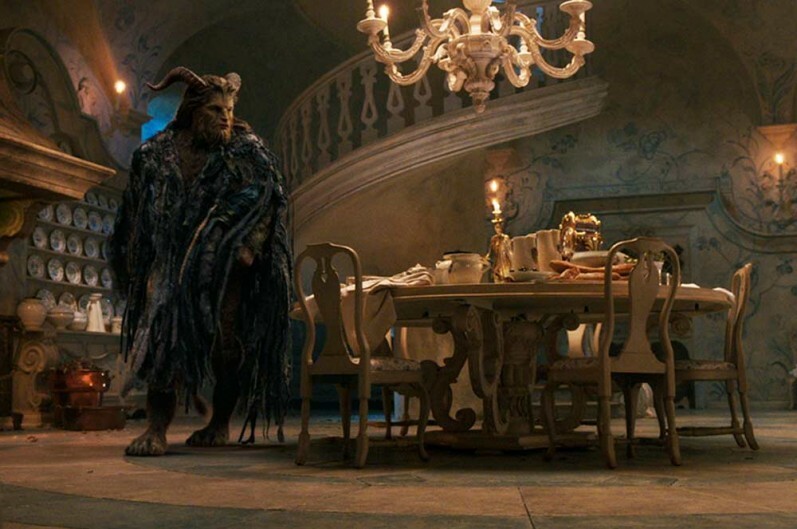 Greenwood says they were striving for a timeless, European feel in the tradition of the great Hollywood romances. 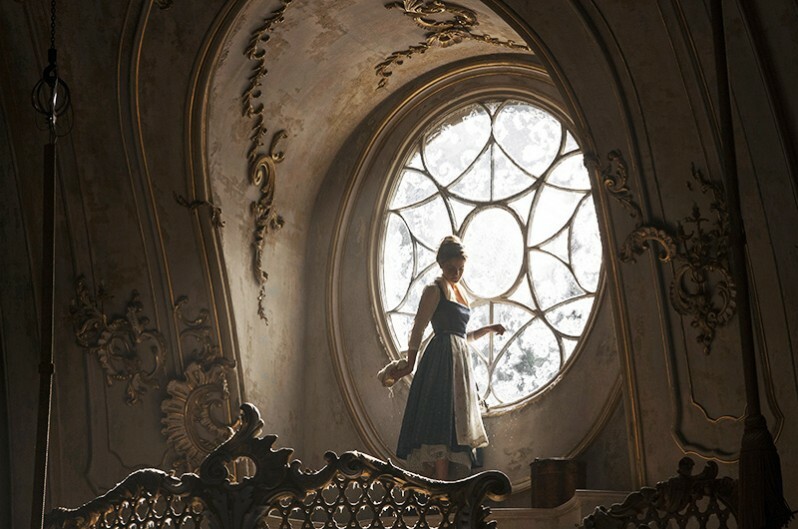 The story is set in a specific time and place, mid-18th century France, as opposed to an undated alternate fairy tale universe, and while each department’s work was influenced by the animated film, the sets, props, costumes and hair and make-up were often authentic to 18th century life in France...a fairy tale set in that universe. 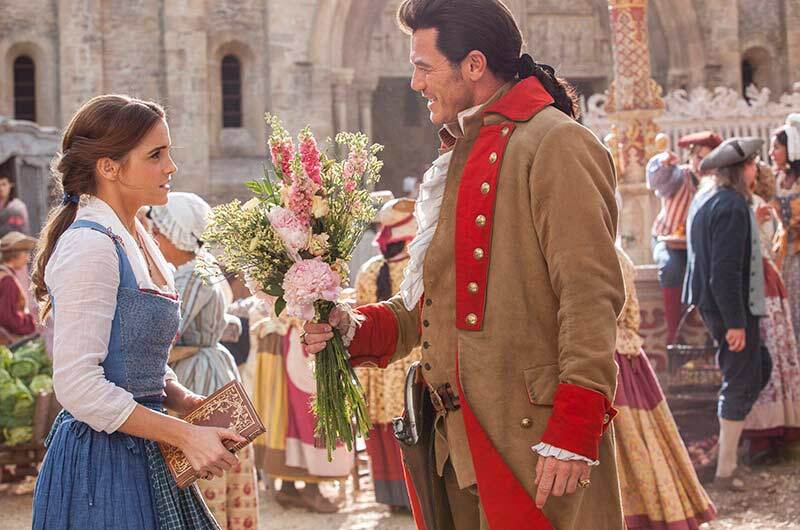 The fictional town of Villeneuve, the village where Belle [Emma Watson] and her father Maurice [Kevin Kline] live, was built on the backlot at Shepperton. 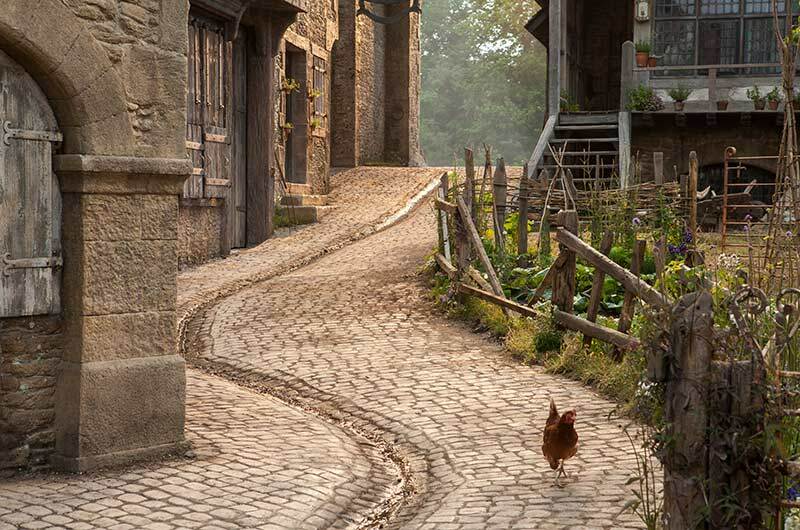 For the production’s largest set (measuring 28,787 square feet), Greenwood, Spencer and their teams drew inspiration from the village of Conques in Southern France. 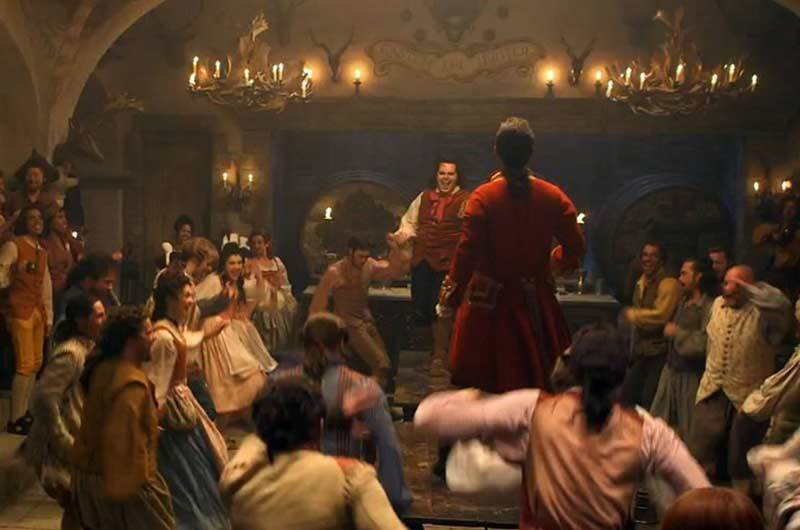 Included in the town, which was named after the author of the original Beauty and the Beast story, Gabrielle-Suzanne Barbot de Villeneuve, is Belle and Maurice’s cottage and his workshop, a school house, a dress shop, a village tavern, a church, fountains and the village square and market. 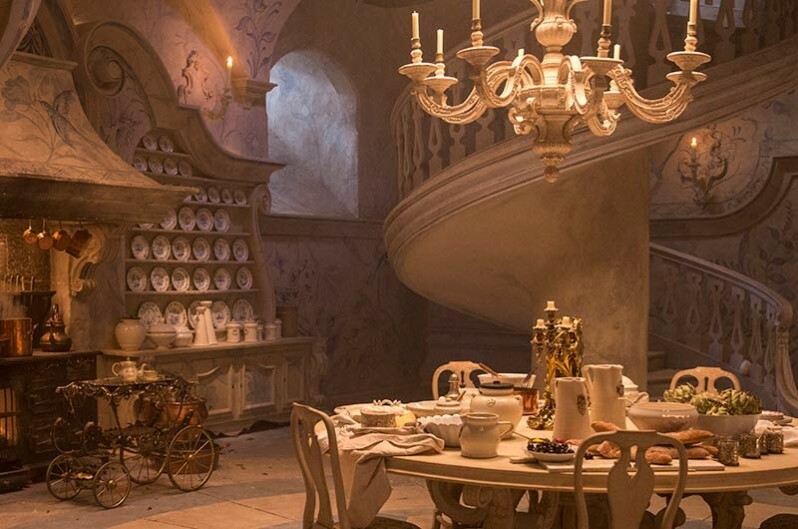 For the film’s epic opening number, “Belle,” which takes place in Villeneuve, more than 150 extras, hundreds of animals, 28 wagons and countless props and set decorations were used, each with distinctive detail. 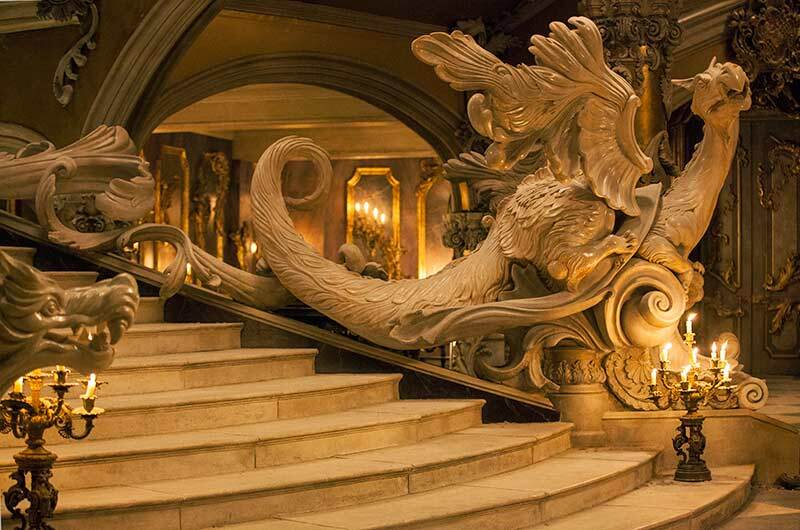 Over 1,000 crewmembers worked around the clock to build and decorate all the mammoth sets, providing an incredible amount of hand-detailed artistry. 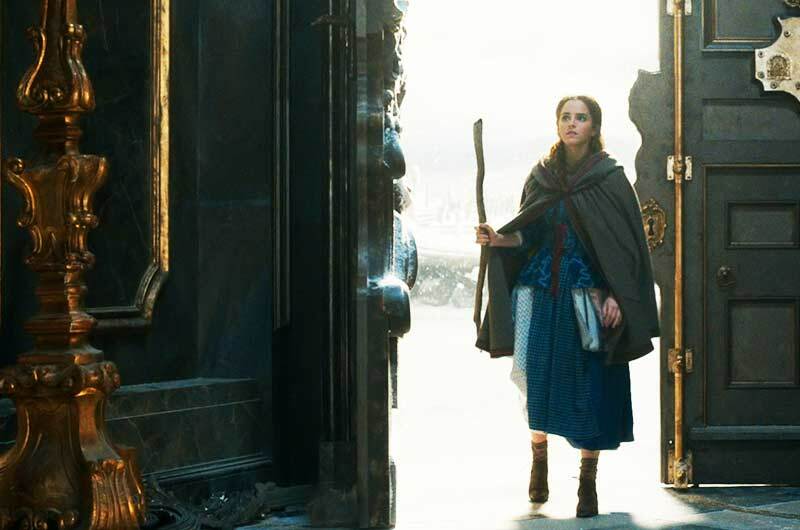 Emma Watson notes, “I’ve worked on films before where the craftsmanship has been amazing, but this film has been really special because they’ve taken something which is so well known and loved and somehow managed to keep what we know and love but also expand on it and give it more detail and more depth and more layers. 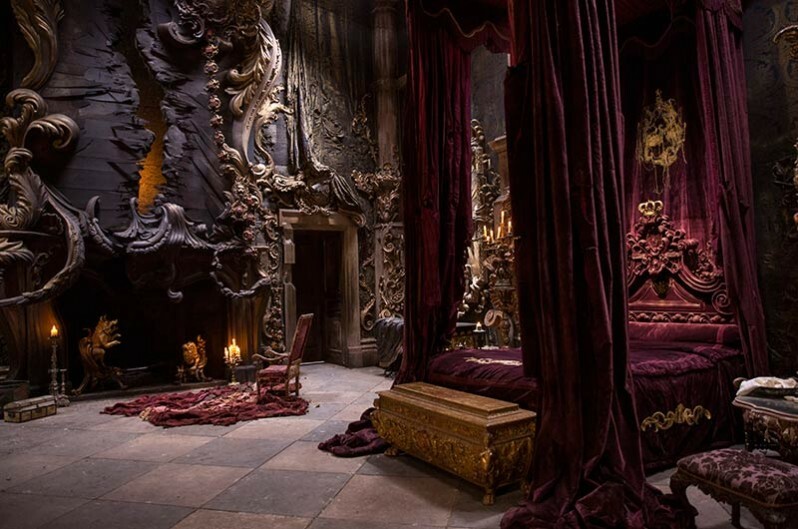 Everyone felt there was so much more to explore..."
Belle’s bedroom, like the ballroom, is located in the benevolent enchantment area of the castle and is designed to appeal to every little girl as the ideal fairy tale bedroom. 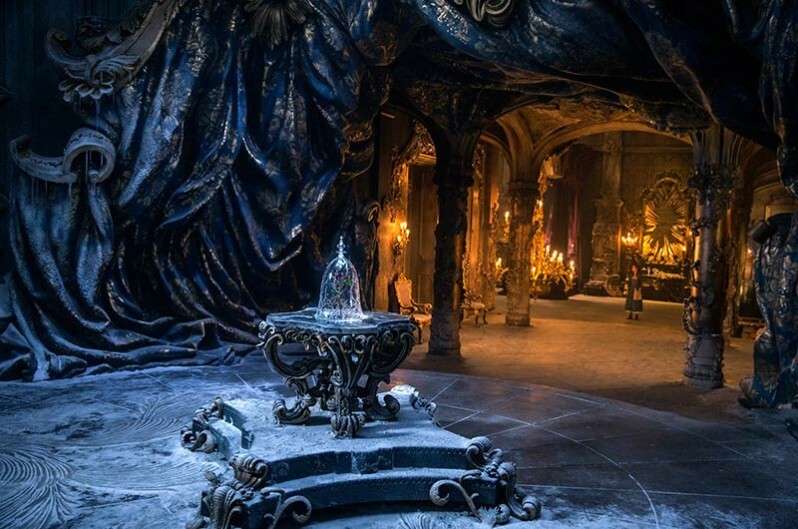 The west wing, where the Beast often retreats, is the epicenter of the enchantment and is designed in Italian baroque, which is more sinister and dark in appearance. The castle’s library is based on the design of a celebrated library in Portugal and is relevant to an important theme in the story: the thirst for knowledge and the vital role books play in feeding the imagination. 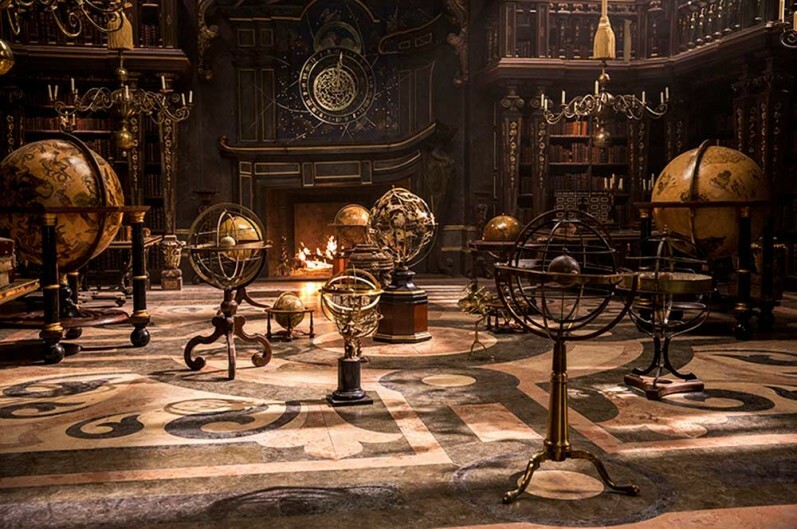 The floor is made from approximately 2,000 square feet of faux marble and features thousands of books which were created especially for the production. 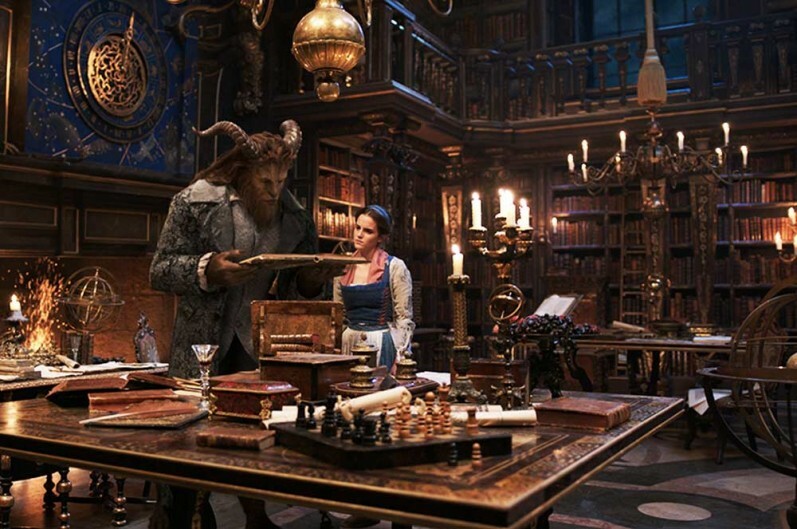 "What I like about this version of BEAUTY AND THE BEAST is the fact that it’s like old technology and new technology," proffers Greenwood. 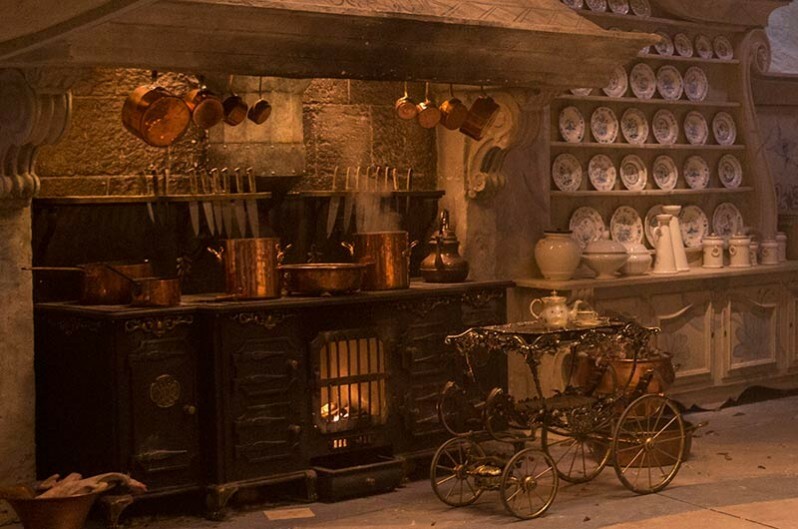 "These are big, bang, kind of old-fashioned sets, proper big old sets, BUT into that, we bring the latest technology with the house itself, with the creatures. 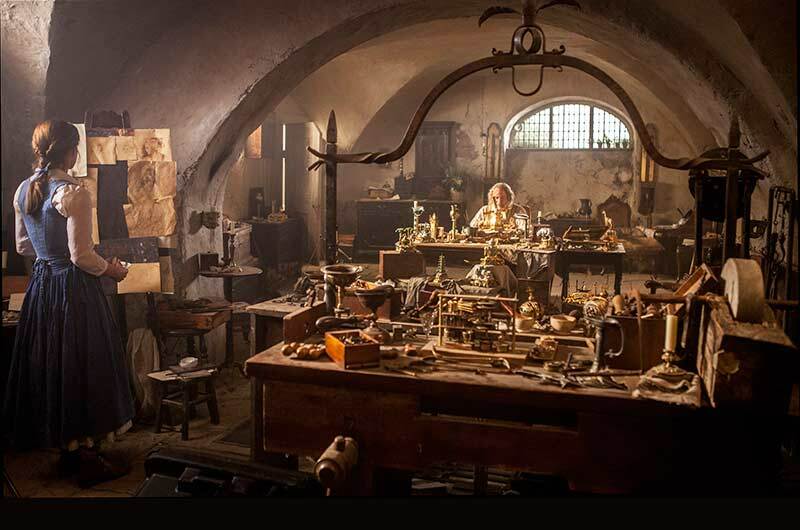 We’ve made perfect models...we created the beautiful objects...and then with the latest computer technology, which we’re using, they come alive! So it’s this combination of old and new. 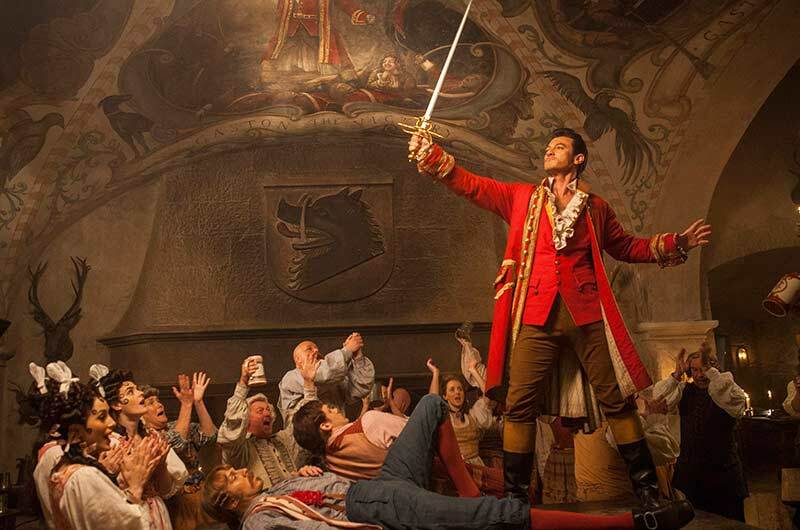 The whole process is amazing, and then that it’s a musical, so to include the dancing, it’s all so complicated, but to have been allowed the opportunity to work on a film like this, it’s just incredible." 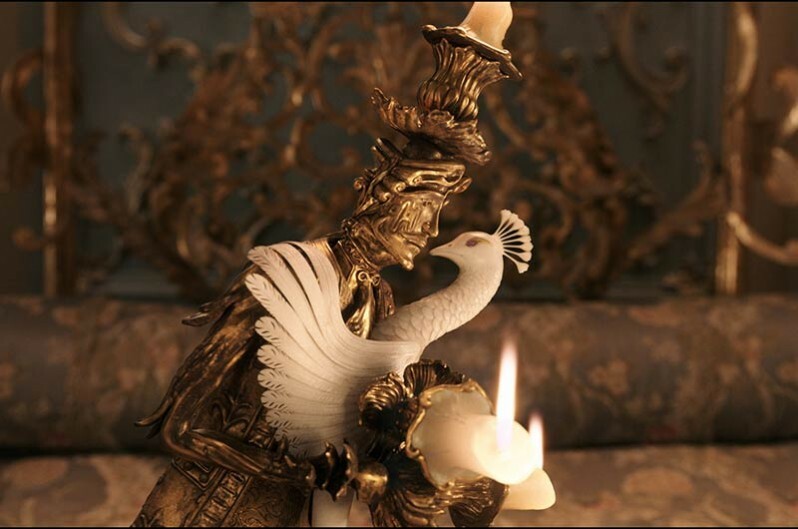 Two delightful new characters were added to the castle and film... a maestro who, along with his diva, is performing for the Prince at the castle when the spell is cast. 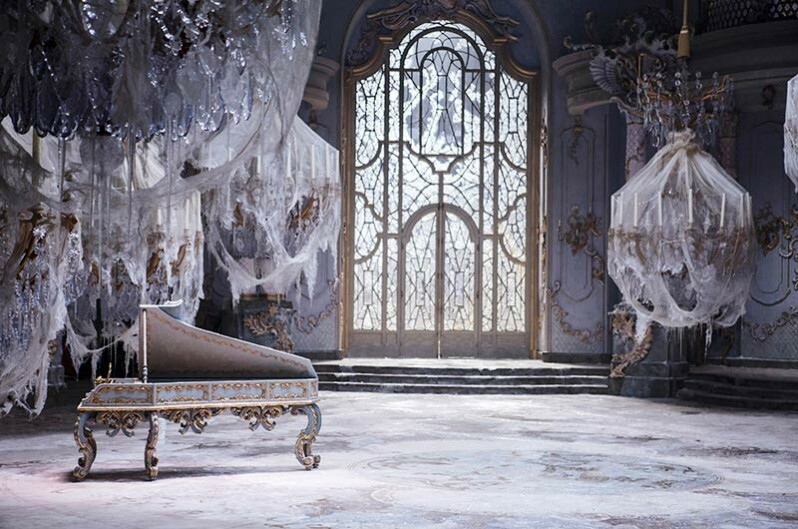 Maestro Cadenza [Stanley Tucci] is now a harpsichord confined to the vast empty ballroom. 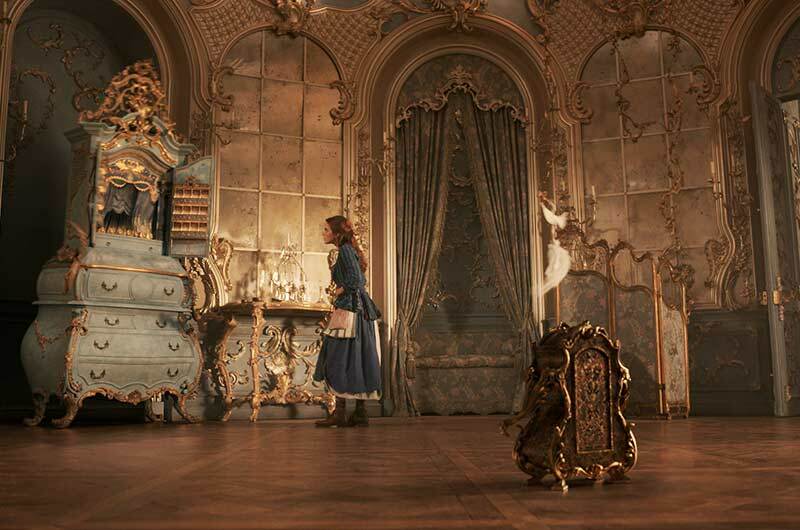 Cadenza’s wife, the renowned Italian opera diva Madame de Garderobe [Audra McDonald] has been transformed into an enormous armoire wardrobe in Belle’s bedroom at the castle, the same room where she had previously stayed herself, when she was the visiting opera singer accompanied by her devoted husband, who is now both close by and far away. 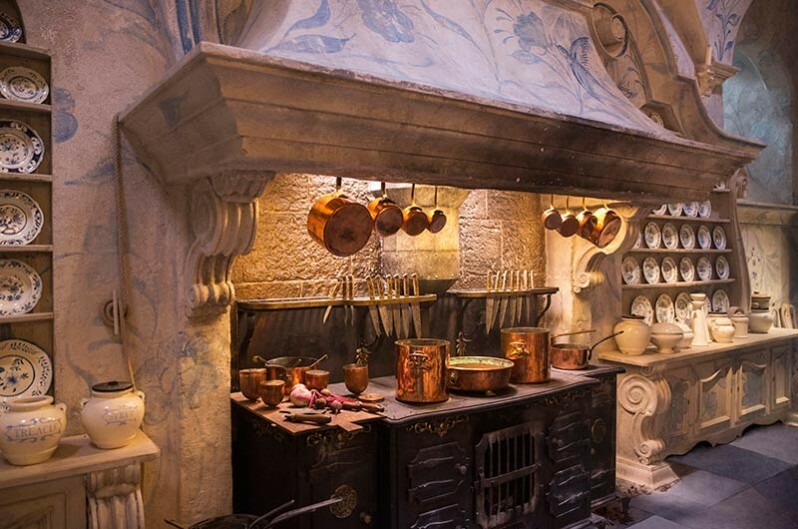 Garderobe has a flare for melodrama and a proclivity for frequent naps. 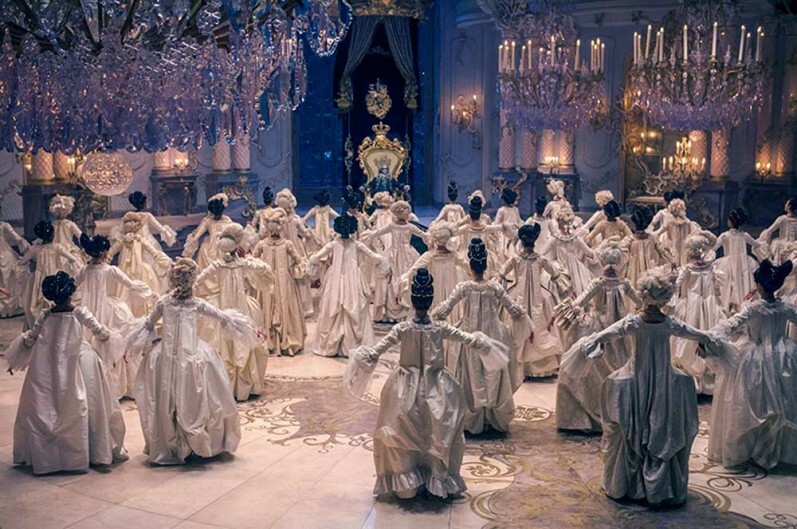 When she designs Belle’s ballgown, Madame de Garderobe takes gold gilding from the ceiling of the bedroom and sprinkles it onto the gown. 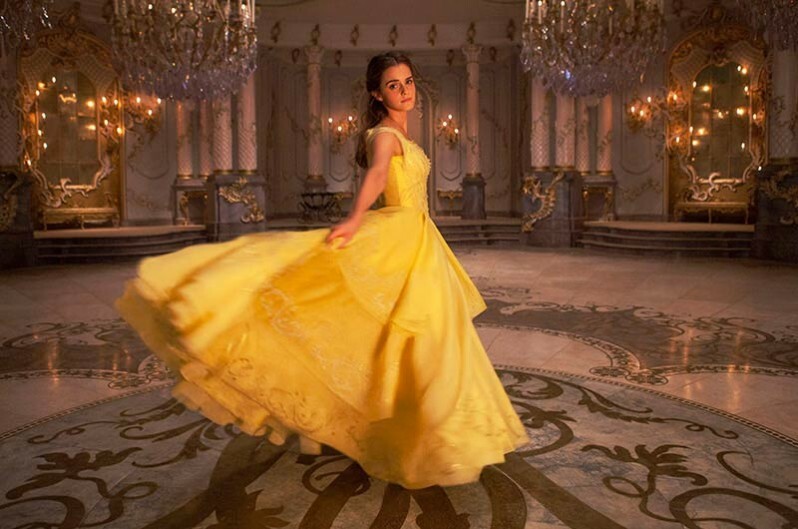 The dress Emma Watson wears in the film was created from multiple layers of feather light satin organza dyed yellow—180 feet of fabric, which was cut broadly in a circular shape and required 3,000 feet of thread. 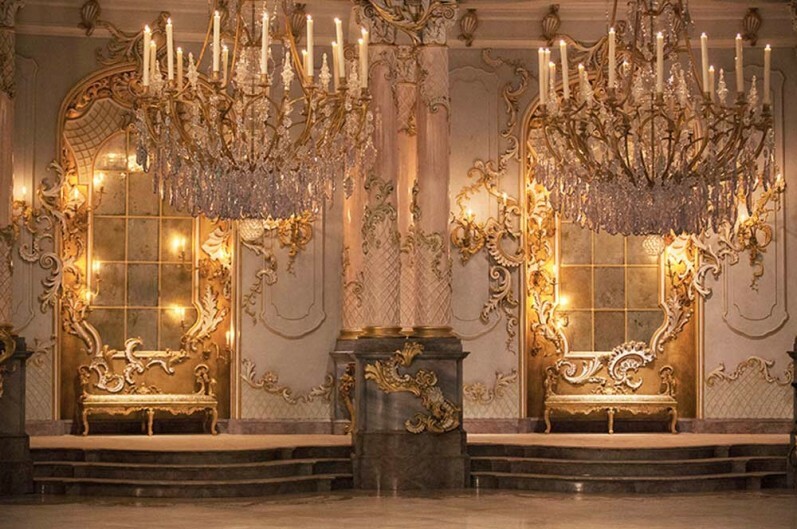 The top two layers were printed with gold leaf filigree in a pattern matching the ballroom’s Rococo floor and accentuated with 2,160 Swarovski crystals. 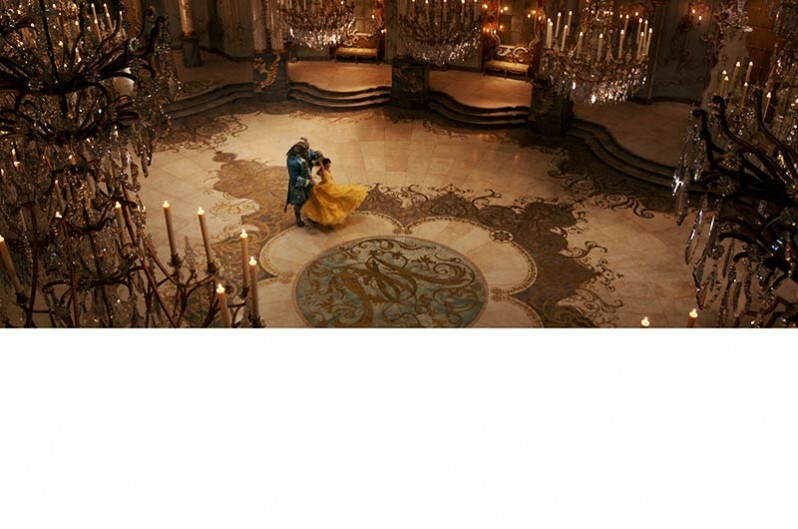 Add those to the thousands in the chandeliers and it's a completely magical scene!